England and Sale wing Denny Solomona has been banned until 8 May for making a homophobic slur in a Premiership match against Worcester last month. Solomona disputed the charge but was found guilty by the RFU panel and given an initial six-week suspension. This was reduced to four because of mitigating factors like his recent record and conduct at the hearing. Solomona, 24, will not play again this term unless Sale, who have not appealed against the ban, reach the play-offs. In a statement, Sale said: "Although disappointed, Denny Solomona and the club have accepted the four-week ban handed down for conduct prejudicial to the interests of the union or the game." Microphones picked up Warriors fly-half Jamie Shillcock raising the issue during the Sharks' win. 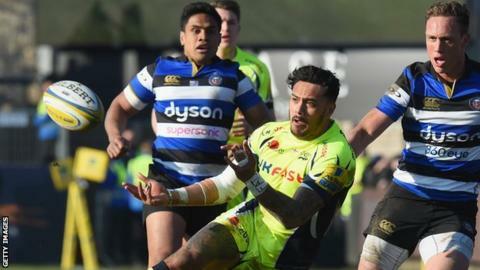 BBC Sport understands the word alleged to have been said by Solomona, who signed a new deal with Sale in February, is similar to that used by Toulon's Mathieu Bastareaud in a European Cup match in January. Both Sale director of rugby Steve Diamond and Worcester counterpart Alan Solomons said after the game that they had not seen or heard the incident. Solomona, capped twice at Test level, was sent home early from an England pre-season training camp in August 2017 because of "team culture issues", which were understood to be alcohol-related. He was recalled to the England squad during this year's Six Nations but did not feature.